We’re heading into the hottest time of the year here in Ohio and there’s no better way to beat the heat than with a frosty, summertime treat! 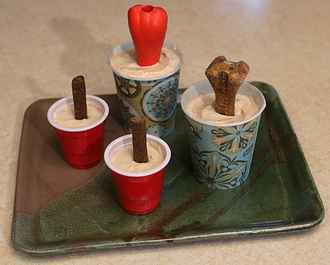 Here are three tasty recipes for quick and easy frozen dog treats that’ll keep your pup cool all summer long. 1. Puree chunks of watermelon in a blender or food processor. 2. Blend in coconut milk and honey. 3. Fill an ice cube tray with the mixture. 4. 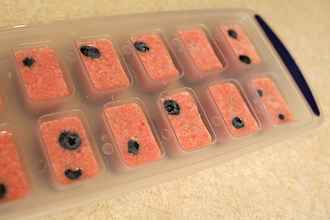 Drop a few blueberries into each cube and freeze. Tip: Try adding banana or strawberry slices for more variety. Edible bones or bully sticks. *Make sure the yogurt and peanut butter don’t contain xylitol. 1. 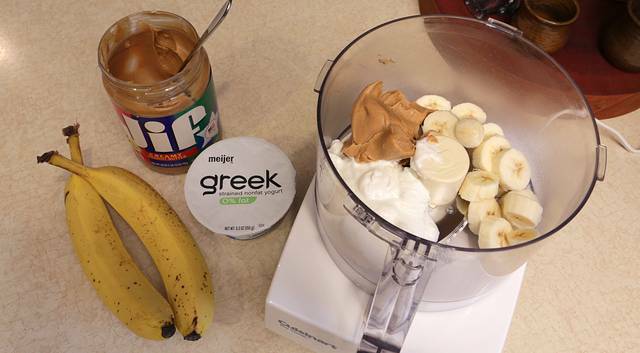 Blend yogurt, peanut butter and banana in a food processor or blender until smooth. 2. Spoon mixture into paper cups. 3. Add an edible bone or bully stick and freeze. 3. Peel away paper cup and serve. Tip: For a special surprise, substitute a rubber or Nylabone-type chew toy in place of the edible stick! These are three layer pupsicles with sweet potato on the top and bottom and yummy chicken chunks and broth in the middle. 1. Puree the sweet potatoes in a food processor or blender. 2. Fill paper cups 1/3 full with sweet potato, then insert a carrot stick in each cup and freeze. I used a small piece of foil to help keep the carrots in place. 3. Add a layer of chicken, then cover with chicken broth until cup is 2/3 full and freeze. 4. Add the final layer of sweet potato and freeze. Tip: To easily fill small cups, put the pureed mixture into a ziplock bag, cut off one corner from the bottom of the bag, then squeeze the mixture into the cups. All three recipes were a hit with Haley, but the clear winner was the peanut butter and banana treat. She loved the flavor and the fact that her favorite edible bone was buried inside all that yumminess put it over the top! 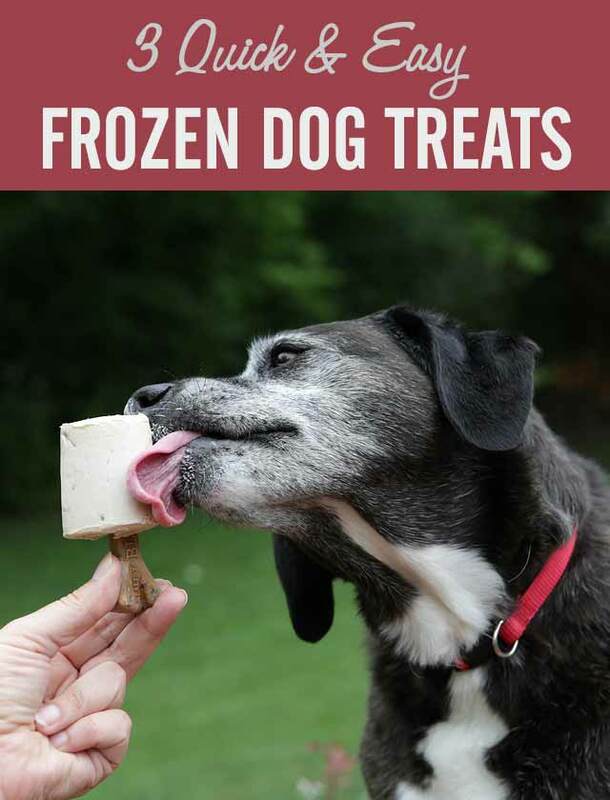 If you feed your dog a raw diet, Rodney Habib from Dogs Naturally Magazine has you covered with this healthy, frozen treat. 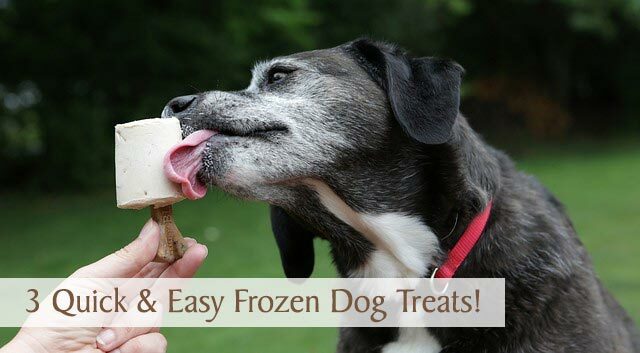 Frosty treats are the perfect way to keep your dog refreshed when the summertime temperatures soar. Plus, they keep your pup occupied for a while so you can put your feet up, relax, and soak up some sunshine yourself. The fun thing about making your own treats is, you can get creative and experiment with different ingredients. Next on my list is pumpkin with apple slices. Just be sure not to include any foods that can be harmful to your dog, especially anything containing xylitol which is showing up in more and more foods these days. Here’s a fun quiz from DogVacay to test your knowledge of dog-safe foods. Also, it’s a good idea to let the treats defrost a little before serving so they’re easier to eat. If your panting pup is ready for a cool down, whip up some of your own frozen dog treats and tell us your dog’s favorite taste combinations. Yummy! I need to come by your house. All I get are bananas around here. WOOF! Stop on by, Piranha. We have lots of leftovers! ? The little ones are the perfect size for Happy. They’re so cute but Haley gobbles them up in one bite, haha! Watermelon juice is pretty tasty! Bailie has peanut banana frozen Kongs and stuffed bones a lot around here. Yum! We haven’t made frozen Kongs in a while. The peanut butter, banana mixture would be the perfect consistency for that. ?? I know chow hound Marsha would eat them all and absolutely LOVE the peanut butter and banana! I love the idea of the edible and/or chewable sticks! You can get really creative with the sticks. A bully stick would last for a while too! All of those sound like super tasty treats! Thanks, Oz! I bet frozen treats are a must-have necessity down there in Florida. ? Love your addition of fun alternatives to the basic popsicle stick -I’m sure all the dogs would agree yours are more tasty and fun! It also gives them something to do after eating the pupsicle. I think Haley liked the bone better than the treat though, lol. I just love seeing all these pupcicles. I really need to start making them for Ruby. Heck, a couple of these look like I might like them as well! The watermelon blueberry cubes are really good! But the other two are definitely more for the dogs, haha. ? These are pawsome treats! Thanks for the suggestions! Aw, you’re quite welcome Tootsie! Thanks for stopping by today. ? Those all look yummy. I think the sweet potato and chicken pops would be a huge hit here in Doodleville. Will definitely make that a project for us this weekend. Thanks Elaine! Those are probably the healthiest ones too. Great choice! Haley was thrilled when she discovered there were chicken chunks hidden in the middle. ? Haley’s a huge peanut butter fan too and loves her frozen peanut butter Kongs. Glad you stopped by, Melody! ? This weekend is gonna be very hot! So I’m def making these for my pups!! Thank you for sharing, I’m so happy I bumped into this post!! Let me know how they turn out, Valerie. 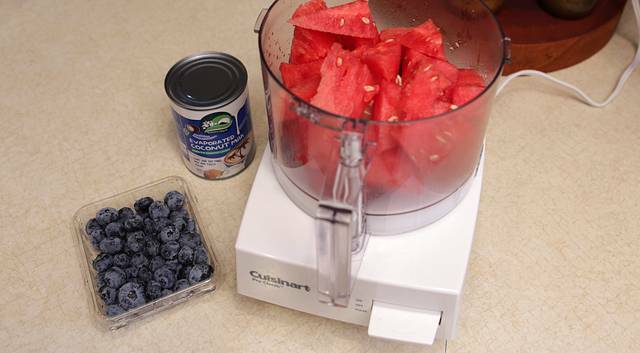 The watermelon blueberry recipe is especially refreshing when it’s really hot. Okay, I must be really hungry, those watermelon blueberry cubes sound pretty darn good right about now! 🙂 And love the idea of using bully sticks and Nylabones as popsicle sticks. Thank you so much for sharing these! Yes! The watermelon blueberry treats are yummy and human-worthy. The other two? Not so much, haha! ? I’ve made a variation on that peanut butter banana business, and it really is tasty! The one hack I do: I made a few for people. The dog versions have cookies, but I just use toothpicks or straws for the human ones. That way, I get to eat some too! Hmm, I think I could use your recipe hack since the humans here didn’t care for my peanut butter version. It looked really good and was Haley’s favorite, but I think it needed something more for us to enjoy it. Maybe honey? I’m drooling all over my computer! Need to share these with my humans!!! Haha! I sure hope that doesn’t affect a work stoppage on those fantastic blog posts. ? I love your “results” pic — these look fantastic. I’m going to try the Watermelon and Blueberry cubes as they look good enough for me to eat. I also really enjoyed your pictures — I’m always looking for something easy I can do after dinner when they all want more than just their evening walks. I highly recommend the watermelon and blueberry cubes and they’re so easy to make! ?? Pupsicle #3 sounds like the winner for Rita! (Unfortunately she doesn’t like any fruits and doesn’t even like peanut butter!) Hope your weahter’s not toooo crazy hot. It’s been lovely here – even a few degress below normal which is a lovely switch after the last few really hot years we’ve had. We could use some of that cooler weather right now. I hope it heads our way. ? Send a big “thank you” to Mom for sharing the recipes! ? Those look delicious and Haley is a lucky dog to have such a spread in front of her! She was such a patient girl while waiting for them to freeze, lol! How gourmet! That beats frozen chicken broth any day! Yes, a little variety to spice things up! ? 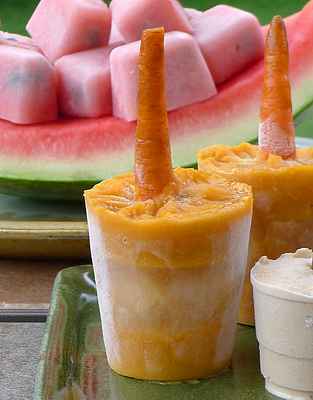 These are great, love the carrot as a popsicle handle! You may have inspired me to get in the kitchen and create some treats for our dogs! Yay! There will be some pup smiles (or drools) in your kitchen soon, lol! I hope Laika loves them. They are so good, I’ve eaten more than Haley so far, haha! ? I’m not sure if you are aware of this or not, but some chicken stock/broth has onions in it, which are bad for dogs. You may just want to check on that. Thanks for mentioning that, Jodi. I edited the post to check for onions or garlic if you buy chicken stock. I would never have thought about pineapple and pumpkin, but Haley would probably love that! Those are some great summer treats. Thanks, JoAnn! I hope you’re having a wonderful summer with your beautiful Chessies. Oh my, those all look super tasty – Missy & Buzz would love all of them! 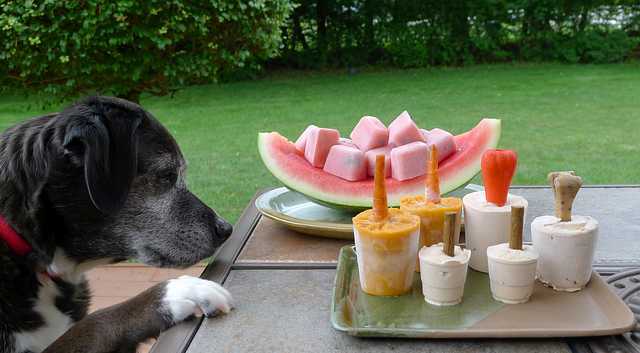 Thank you also for including Rodney Habib’s raw version of a doggie popsicle. 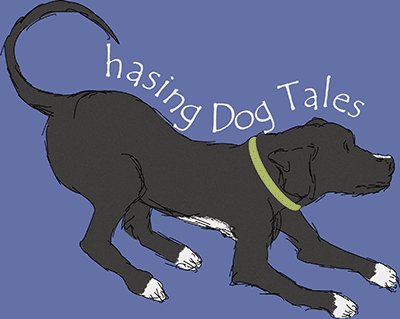 He comes up with great recipes – I have the turmeric paste one I make for the pups from him. I thought Rodney’s recipe looked really good and I loved his creative video skills. I have that same turmeric recipe, but I haven’t made it yet. So far, I’ve just been sprinkling a little on Haley’s food. These all look so delish!! My dogs love PB & bananas, I must try this one! I think the peanut butter/banana combination is a clear winner here with the pups, lol! ? How fun, Valerie! Let me know if you find a new recipe that’s a hit. ? Those look like yummy treats. I have actually made the first one. They are always a hit with the brown dawgs. Those are my favorite too, Linda! ? ?